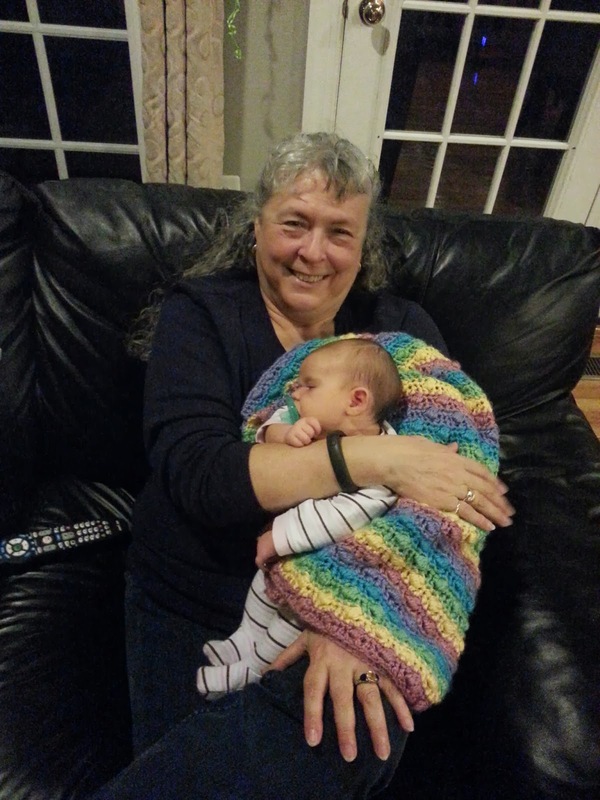 Letters to Baby: 5 weeks more grandparent fun! I finally get to sit down at my computer to catch up. I'm so fortunate to have so many willing hands to hold you! This week has been somewhat eventful, from your grandparents coming to visit to your one month check up. First, your check up. You're a healthy kid. It's official. Also, you know you have a big baby when the nurse walks in and says, "So, you're here for your two month check up?" Uhhh...nope. 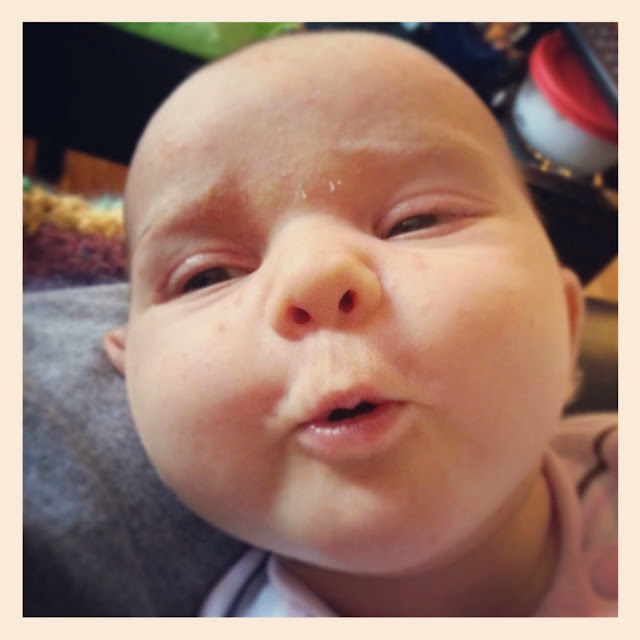 You're in the 90th percentile for both height and weight. I adore this picture. I haven't managed to get one of your smile yet, but you were so happy here! 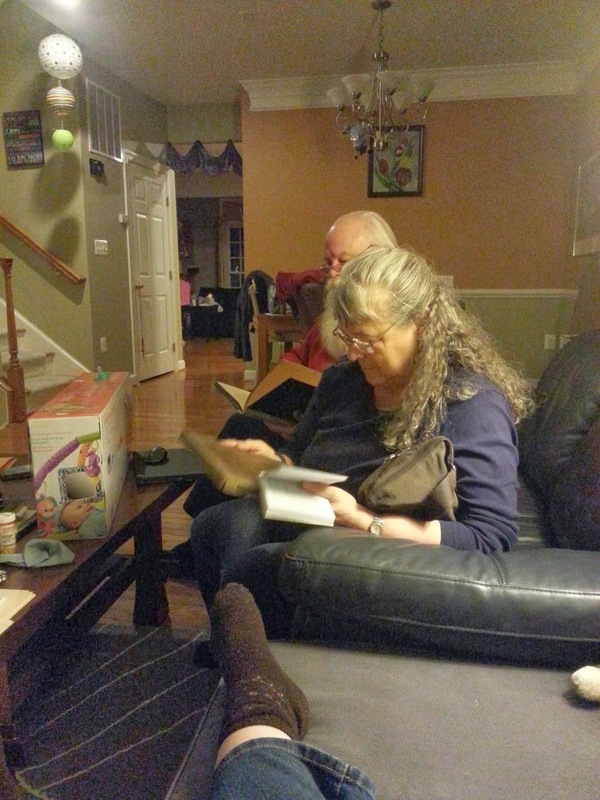 Your Grandparents arrived on Thursday night, and we've had fun with them. They've both enjoyed getting lots of snuggles in with you. Last night we tag teamed going out to dinner so that grandma and I went first, and then grandpa and dad went. It worked well (for us) because you apparently cried for dad for a bit. You were great for us, and Aishah put you to sleep. After dinner, we were sitting around reading from The Prophet by Kahlil Gibran, which is one of your father's favorite books. Here is a picture of your grandfather reading you the section On Children. What a beautiful way to finish the night. 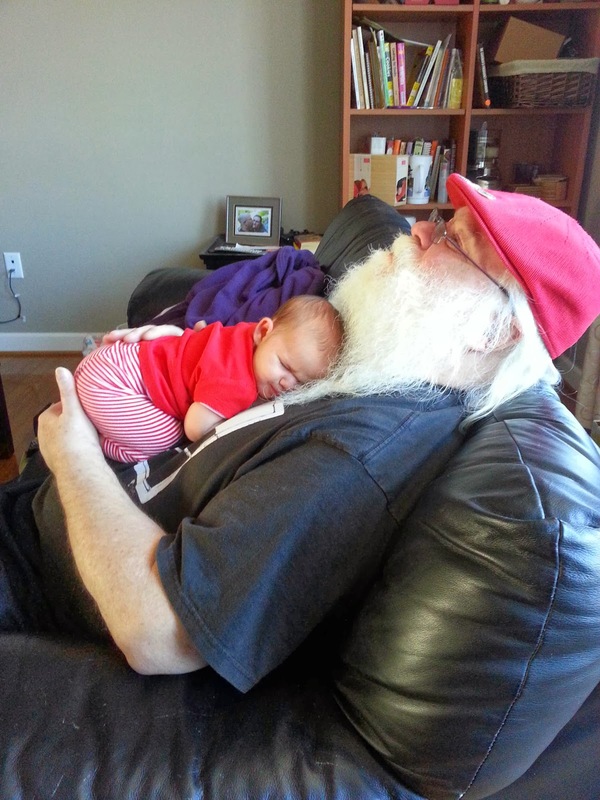 I promise to post more pictures, but here is naptime with Santa, and snuggles with Grandma. Grandma and I went through the nursery and tidied, and rearranged it. You never fit into newborn clothing, so now we have to decide what we want to keep for potential future babies, or give away. Henry has been using your crib as a very expensive cat bed, so we put down a washable blanket for him to lay on, (although today Newton was laying in there), and actually made the bed. Maybe you'll lay in there one day soon. Since you still wake up every time I put you down when you're sleeping (except if you're in your swing), you're not really ready for naptime in your crib yet. 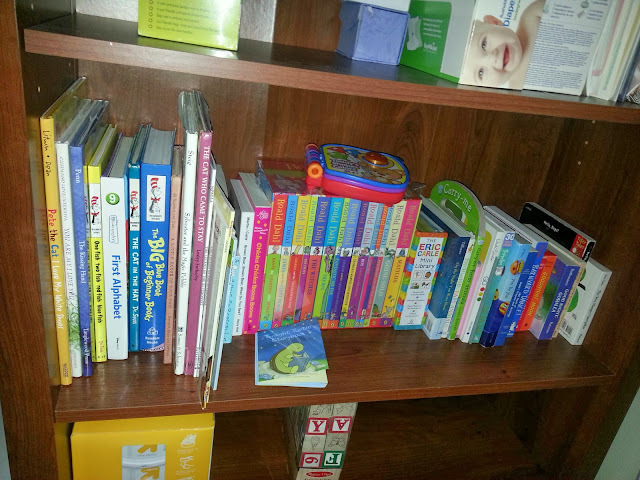 I managed to get a picture of the majority of awesome books that we've been given. I bought the Roald Dahl collection for Christmas, because they were my favorite as a child, and our wonderful family and friends have given us the rest. I wonder what your favorite book will be! We've introduced you to more geeky wonderful things, watching both the new Star Trek movie, and Star Trek 2. We're still watching Star Trek New Generation, because I love it, and Patrick Stewart. I started watching House of Cards while you're nursing, and I apologize in advance if you grow up and have this urge to be a cut throat politician. I'll try to squelch it. Maybe it's all the baby huffing I do, but things going on that would normally make me extremely stressed and anxious, just aren't. I am so blessed you're in my life little girl. Thank you for being such a wonderful and good tempered baby. You're a joy to be around, and everyone just wants to kiss your cheeks.